My grandmother loved rubarb and use to make a homemade sauce for which I am trying to find the recipe. Because I love ice cream, I tried this recipe using the fresh rubarb I got from the farmers market today. Everyone really enjoyed this recipe and it was such a refreshing treat after our BBQ last night. You can make a nonalcoholic version of this ice cream by substituting cranberry juice cocktail for the wine. Combine milk and half-and-half in a heavy saucepan over medium-high heat. Heat milk mixture to 180° or until tiny bubbles form around edge (do not boil). Combine 1/2 cup sugar and egg yolks in a large bowl, stirring with a whisk until pale yellow. Gradually add half of hot milk mixture to egg yolk mixture, stirring constantly with a whisk. Pour the egg yolk mixture into pan with remaining milk mixture; cook over medium-low heat until a thermometer registers 160° (about 2 minutes), stirring constantly. Place pan in a large ice-filled bowl for 20 minutes or until custard cools completely, stirring occasionally. Combine remaining 1/2 cup sugar, rhubarb, and wine in a saucepan over medium-high heat; bring to a boil. 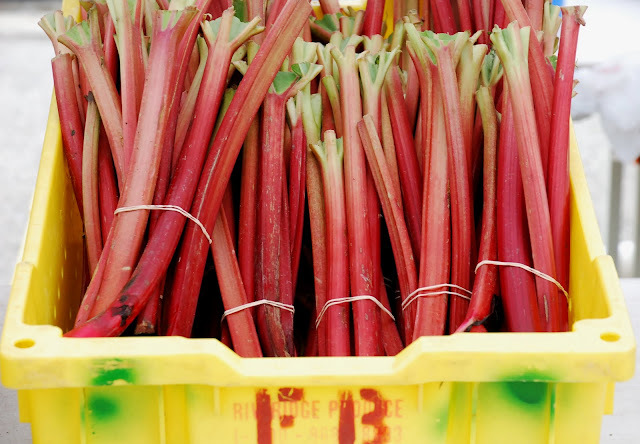 Reduce heat, and simmer 8 minutes or until rhubarb is tender and liquid is syrupy. Remove from heat; let stand 10 minutes. Combine rhubarb mixture and strawberries in a blender; process until smooth. Strain mixture through a sieve over a bowl, pressing with a wooden spoon; discard solids. Stir rhubarb mixture into custard mixture. Pour custard into the freezer can of an ice-cream freezer; freeze according to manufacturer's instructions. Drain ice water from freezer bucket; repack with salt and ice. Cover with kitchen towels, and let stand 1 hour or until firm.